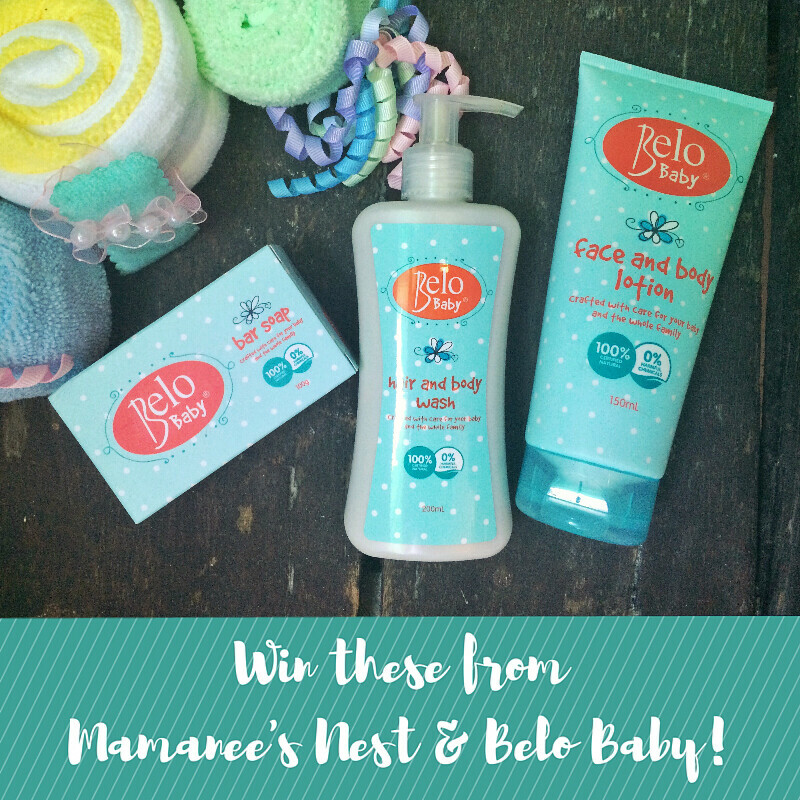 Mamanee's Give-away| Win A Belo Baby Gift Pack! Do you Want to Win Baby Belo Products? Of course you do! I have been raving about Belo Baby Products ever since I had the chance to experience them and review them on my blog. What I really love about Belo Baby is that it’s 100% all-natural, with ingredients like Shea Butter, Cocoa Butter and Almond Oil, you can be sure that your baby’s delicate skin as well your own is safe. Not to mention that these are free from Parabens and other common allergens which makes it free from harmful chemicals. Pretty awesome right? Remember, I also told you about their Instagram contest last week? You can still join until June 03, 2016. Where all you need to do is to post your most memorable and creative shots of your baby on Instagram with the hashtag #BeloBaby and tag @BeloBabylove for a chance to win Belo Baby Products and a photo session for you and baby! Check this cutie video on how bath time and massage can be a wonderful journey for you and that little munchkin of yours! The thing is my dear lass, since I have had such a wonderful experience with using products from Belo Baby, I also want you to try them for yourself and your little one. So, I will be picking 3 – yes, three winners! That's one winner from Facebook, One from Instagram and One from Twitter! So that you too can get that Belo Baby Experience that you and your little bundle of happiness deserve and I have prepared three easy ways to win. I will be raffling off one gift pack from Twitter, Instagram and Facebook. You may choose any of the options below, or to raise your chances, you may do ALL 3 options! Like Mamanee’s Nest on Facebook. Like Belo Baby on Facebook. No Cheating lasses! Every entry will be validated. Incomplete steps will invalidate your entry. Only one entry per Social Media Account each (Facebook, Twitter or Instagram). Winner must have a Philippine deliverable address. Three (3) winners will receive a gift pack containing 1 Belo Baby soap, 1 Belo Baby Hair and Body Wash and 1 Belo Baby Face and Body Lotion. Entries will be accepted until 11:59PM of June 03, 2016. Entries submitted after deadline will no longer be counted.Winners will be filtered based on their entry (if complete) and will be picked via Random on June 06, 2016. Winners will be notified on Mamanee’s Nest Facebook Page for the Facebook winner, on Twitter for the Twitter winner and on Instagram for the Instagram winner. Winners will have 48 hours to send their details or prize will be raffled off to another winner. Prizes will be shipped to winner. Belo Baby and Mamanee’s Nest will not be liable for loss of package during shipping, damages caused by shipment or delay due to an undeliverable address.